I had two books to choose from and couldn’t decide which one to promote as the Book of May, and so . . . I chose both. 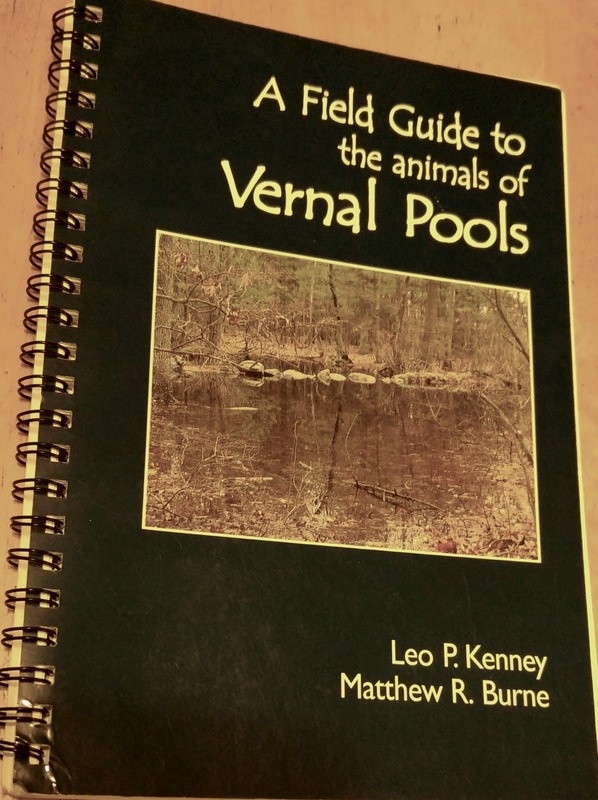 The former, A Field Guide to the animals of Vernal Pools by Leo P. Kenney and Matthew R. Burne, is about 8″ x 5″ and fits easily into any pack I decide to carry. Its pages are glossy, so I don’t worry too much about it getting ruined if I get it wet. And though it was written to represent Massachusetts, most of the species described match what Maine vernal pools have to offer. After an introduction to vernal pools, their indicator (obligate) species, protection, importance and human impacts upon them, there is a pictorial guide to the adult amphibians and reptiles. This is a quick and easy reference, and especially useful when trying to determine the difference between species, e.g. bullfrogs and green frogs or leopard frogs and pickerel frogs. Besides frogs, it includes salamanders, snakes and turtles. And then there are more descriptive pages for each species. These have helped me over the years to gain a better understanding of what I’m looking at. Even today, when Jinny Mae and I discovered these spotted salamander eggs, I loved that we could see that gelatinous matrix that surrounded the individual eggs. And the book has helped me recognize the difference between those salamander eggs and these wood frog eggs. In the field, there’s so much more to see, including the invertebrates that inhabit the pool, and ever so slowly I’m learning to identify them as well–you know, predaceous diving beetles, damselfly larvae, water scorpions, backswimmers, water striders . . . the list goes on. Each of them is featured in the back of the book with a photograph and paragraph or two describing their larval and adult forms. Maine Amphibians and Reptiles, edited by Malcolm L. Hunter, Aram J.K. Calhoun and Mark McCollugh, is my at-home reference book. Well, sometimes it goes for a ride in my truck, but usually, it’s left at home because it’s larger and offers a much more in-depth take on amphibians and reptiles, their habitats and conservation. Besides a photo gallery, each amphibian and reptile that makes its home in Maine is featured, with thorough descriptions, taxonomic status, distribution, reproduction, habitat, diet, and interactions with people and other animals. There are sketches and maps to further enhance the information presented. And it’s all quite readable. One of the best features of this book (and unfortunately, mine is cracked) is the CD at the end. Yes, you can actually listen to the individual species so that when you hear them in the day or night, you might begin to recognize them, much as you would a bird, by their voices before you spy them. In the past few years, the vernal pool that I study frequently, has dried up before the amphibians have matured. I find solace in the fact that even when the pool dries up, the species growing there still provide nourishment and pass on energy to their consumers. But . . . maybe this year will be different. We had a lot of snow, and now a lot of rain. Maybe this will be the year the amphibians and insects that reside in the pool will actually mature and hop or fly out. It all begins with MAY. In response to this wonderful review of two books, I just had to write to say that it was Leo who introduced me to Vernal Pools at Simmons when he taught in the NSF funded program, EnviroNet, that I also worked with for most of the 1990’s. I had not seen his book, but have been with him to Vernal Pools. I will now get his book (coauthor). Oh, Kay, that’s fabulous. How fortunate for you to have visited pools with him. Thanks for sharing.